Object d'art - French antique Victorian object depicting Aesops fable: Description by Adin Antique Jewelry. This French 18K yellow gold and silver Victorian object d'art is a depiction of substance in many ways. 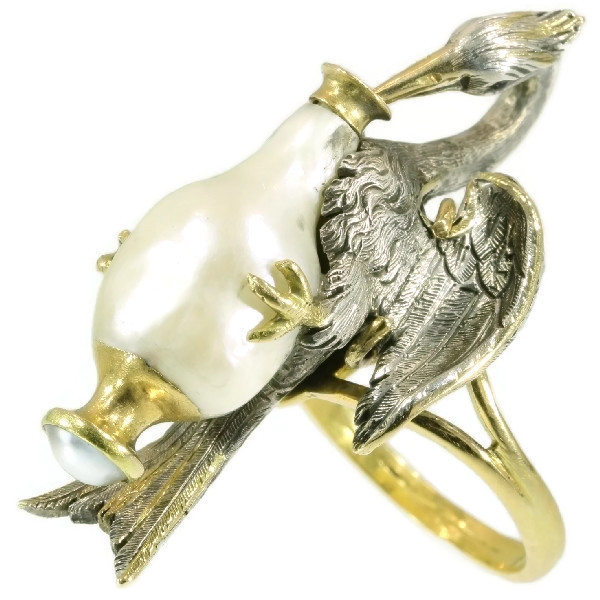 With its wide gold outlined wings, crest and tail, the silver downy stork triumphs audaciously with an amphora crafted from a grand natural saltwater baroque pearl with a gold rim on top and a seed pearl in the gold bottom. Bringing the jar with its gold claws to its gold beak and looking right at you with its cabochon onyx and turquoise eyes, this piece of decorative art is claw-set on a gold shank, which follows the shape of the bird and makes it possible to wear it as a ring. Now, who should be the fox that deserves what's coming her way in your own fable by Jean de La Fontaine? The inspiration for this jewellery piece lays more likely in the translation of Aesop's "The fox and the stork" by Jean de La Fontaine. In the 17th century, he was the most famous French fabulist and an example for writers throughout Europe. We hope you will enjoy looking and learning about this piece as much as we did! Master goldsmith: Although we couldn't find any master mark in the stork, it is because of the level of craftmanship that we think that this could have been made by the house Froment-Meurice. Source of inspiration: Aesop's fable: "The fox and the stork". At one time the Fox and the Stork were on visiting terms and seemed very good friends. So the Fox invited the Stork to dinner, and for a joke put nothing before her but some soup in a very shallow dish. This the Fox could easily lap up, but the Stork could only wet the end of her long bill in it, and left the meal as hungry as when she began. "I am sorry," said the Fox, "the soup is not to your liking." "Pray do not apologize," said the Stork. "I hope you will return this visit, and come and dine with me soon." "I will not apologize for the dinner," said the Stork: "One bad turn deserves another." Material: 18k yellow gold and silver. Technique: The stork is skillfully modelled and engraved in silver that has been richly and yet tastefully embellished with gold accents. See the stork's crest, beak, claws, tale, and the outlines of the wings. Extra information: It is almost certain that this piece of art started as a decoration for another, even more, impressive piece. The way the ring to hold it, looks rather simple on first sight but we fully understand and support the way of thinking of the goldsmith who made it. It respects the original piece of art by a master goldsmith and does not alter it in any way. That is why we decided to offer it in the same manner as we found it. Birthstones: Pearl is the birthstone (or month stone) for June, turquoise for December and onyx for July. Hallmarks: The ring is hallmarked with the French control mark for 18K gold representing an eagle's head that was in use in France from about 1838. We couldn't find any hallmarks on the stork.